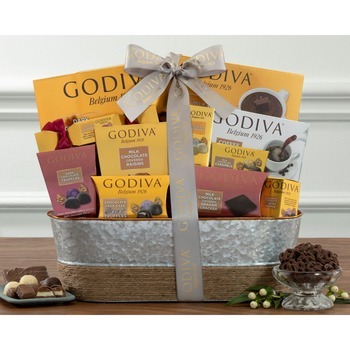 A rich assortment of Godiva confections is assembled for this exclusive chocolate gift basket. 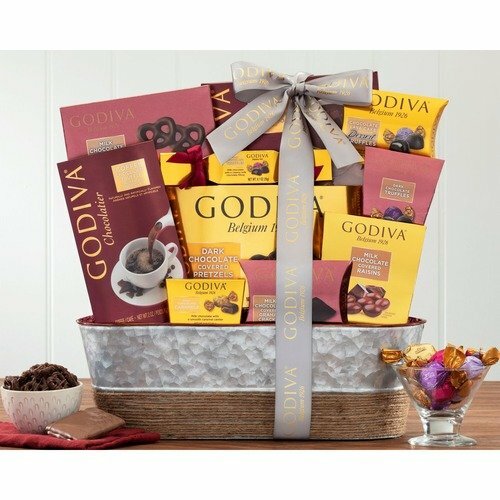 Godiva signature milk, dark and white chocolate truffles, dark chocolate pretzels, assorted dessert truffles including chocolate lava cake, creme brulee and strawberry cheesecake, milk chocolate raisins, hot cocoa, milk chocolate caramels, truffle coffee and a milk chocolate graham cracker make up this rich gift that everyone will enjoy and appreciate. * I am very happy with this web site and the service fees are quite reasonable. It is user friendly, especially when you type the address and the city name and state name automatically come up.